October 31st and November 1st ONLY. Tickets are officially available for 'The Barn' Premiere- limited seating of only 500 seats for the entire weekend (250 per night). Come out and spend Halloween with the cast and crew of 'The Barn' at The Hollywood Theater in Dormont, PA. Enjoy a spooky good time and maybe meet a monster or two (or three) in person. 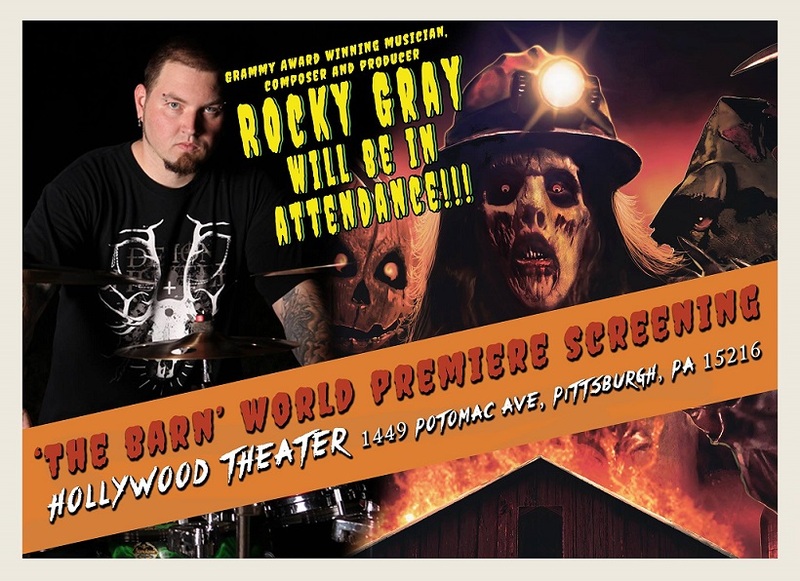 Rocky Gray (Grammy award winning musician, composer and producer from Evanescence and We Are the Fallen...as well as the man behind the retro score of 'The Barn') will be in attendance along with ALL the main cast members and crew of 'The Barn' October 31st and November 1st ONLY!!! Tickets are officially available for 'The Barn' Premiere- limited seating remain for the entire weekend. Come out and spend Halloween with the cast and crew of 'The Barn' at The Hollywood Theater in Dormont, PA. Enjoy a spooky good time and maybe meet a monster or two (or three) in person!! !